The 10 Best Seafood Restaurants in Washington State! Washington State is a formidable force when it comes to seafood. Located on the pristine fishing grounds of the northern Pacific Ocean, Washington has some of the freshest seafood around. The fishing culture makes for a vibrant seafood restaurant scene. Here are the 10 best in the state! Pike Place Chowder offers award-winning traditional clam chowder, as well as other specialty chowders. The repertoire doesn't end there, but extends to delicious Japanese and Mandarin plates as well. If you are looking for the classic chowder, or Asian cuisine, this is the place to go. This classic beach spot restaurant in Seattle is known for its delicious fish ‘n’ chips. Enjoy scenic views of the ocean, as well. Not only does it serve the traditional fish options, but its menu also contains a classic clam chowder raved about by many. Sunfish Seafood is the perfect casual seafood restaurant to enjoy classic seafood along with a view. Christopher's on Whidbey in Coupeville is a simple yet elegant bistro. It serves Pacific Northwest foods, as well as local wines. The menu boasts delicious meals of salmon, clam chowder, and other traditional seafood plates, as well as a raved-about chocolate mousse. Fins Bistro, located in Issaquah, offers a myriad of seafood and steaks. Their salmon salad—a filet, lightly peppered, served with mixed greens—is a common favorite. 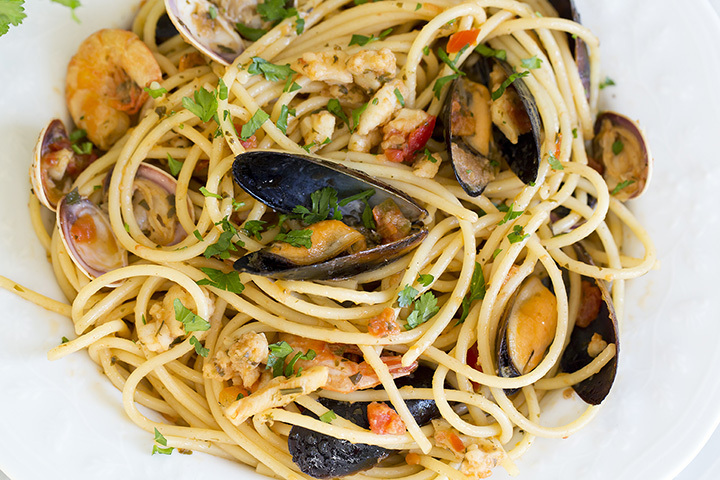 Another seafood dish to try is the seafood linguine, a seafood lover’s dream with shrimp, scallops, clams, mussels, and calamari. If neither of these are what you are looking for, you can always go for a classic plate of wild king salmon. Traditional or contemporary, Fin’s has it all. Milford’s Fish House in Spokane features an early 20th century atmosphere utilizing both brick and brass to complete the look. The restaurant, known for being Spokane's freshest seafood since 1979, offers tasty dishes such as fresh petrale sole stuffed with fresh shrimp, or fresh Alaskan halibut. Milford's is a great restaurant to experience great seafood in a unique atmosphere. Michael’s on the Lake offers an excellent seafood dining experience. They are known for amazing seafood dishes like Mahi Mahi tacos and the Dungeness crab and artichoke dip. Come enjoy the casual and elegant dining right on the shorefront in beautiful Moses Lake, Washington. Andy’s Fish House in historic downtown Snohomish, Washington, gives locals and travelers a great seafood dining experience time and time again. With great indoor and outdoor dining options, come and get spoiled on great seafood here at Andy’s Fish House! Castaways Seafood Grille in Long Beach, Washington, cooks up some seriously satisfying sea fare! According to locals, the halibut fish tacos are hands-down the best they’ve ever had. Come and try the captain’s platter for huge portions and affordable prices. Castaways Seafood Grille is one of the greats! As Bellevue Haute Picks best seafood winner seven years in a row, the Seastar Restaurant and Bar will give you an extraordinary dining experience guaranteed! Let renowned chef John Howie and his team artfully assemble a delicious dining adventure for you and the whole family. Seastar is a perfect place for that long-awaited date, with their fine dining atmosphere, amazing seafood, and vast collection of beers and wines, the Seastar Restaurant and Bar in Bellevue should be on your list! If you want to get your hands on fresh seafood, come and set yourself Adrift! Adrift in beautiful Anacortes is loved by locals for amazing seafood plates such as crab cakes, and salmon burgers, to scrumptious desserts like chocolate cake and fresh baked cookies. Come and taste the difference here at Adrift!